The following eulogy was delivered by Rabbi Delphine Horvilleur at the funeral service of Chantal Akerman on October 13, 2015, at Père Lachaise cemetery. Thanks to Rabbi Horvilleur for permission to publish it here as FQ begins its remembrance of Akerman’s life and legacy. We have gathered to accompany Chantal Akerman in the place called bet hashayim in Hebrew, the “House of the Living,” a title that might seem paradoxical for a cemetery. But there is no question of euphemism here, no refusal to speak about death, nor wish to pretend as if it were not present here. It is on the contrary a question of being conscious that we must speak here about the lives of those who are leaving us, that we must also recognize here, in particular, that life and death do not live in separate places. This might appear counterintuitive: we are so used to speaking of life and death as if the one had to avoid coming into contact with the other at all cost, as if it was necessary for them to keep their distance, hermetically separated from one another. But the reality is very different. In this place, each of us becomes conscious that life and death sometimes achieve a strange cohabitation. And then, certain beings don’t need cemeteries, and know it as if by instinct, almost from birth, as if from the beginning, life and death, the vigorous and the morbid, werein a mutual dialogue, at the heart of their being. It seems to me that Chantal was one of those beings: those who know, however alive they are, that death gets, sometimes, to speak in them, that it haunts their dreams, their plans, and that it leaves its mark. I think that Chantal always knew it. From her earliest childhood. That is what Sylviane, her sister, told me. She was a child who was a little different, a very particular child. A child who had nightmares when she was very young. The child of a survivor. A child born after the catastrophe called Shoah. A night for humanity that she carried in herself, that she took around with her everywhere. That is how, doubtless, the little girl, then the adolescent girl, and then the young woman, learned to live with the ghosts of her family, and the ghosts of a lost world. The ghosts of Tarnów in Poland, the ghosts of Auschwitz where her mother was a prisoner with a good number of family members. The ghosts that moved in with her mother then in Belgium, and in the night of a little girl born just afterward. Chantal inherited all that. A strange gift to welcome her into the world. But she also inherited family treasures, which we should also speak about: granddaughter of a very talented grandmother who painted and drew and whose notebooks she kept, granddaughter too of a cantor at the synagogue with a magnificent voice. God knows whether the musicality of her films does not owe something to him. Most of all, she was the daughter of Jacques Yaacov Akerman and the daughter, the mirror child, of Natalie, “Nelly,” her mother, who inhabited all of her creations to the utmost. Yes of course, how could we not speak of her mother (and yours, dear Sylviane), of what she was for Chantal, of her passing a year and a half ago, and of how Chantal did not perhaps find a way to truly survive her. On the silence of her mother, Chantal placed images, thousands of images, what she calls “noise on the silence” in her autobiographical book. And with these images, she, in a strange way, recreated a world. A world that comes to us through precise places and gestures, like those of Delphine Seyrig who, almost to the millimeter, repeats Chantal’s aunt’s hand movements as she is preparing Wiener Schnitzel, a mimicry, an intonation… So many precise and meticulous gestures and places that say better than any words what the vertiginous loss, what the absence, what the void of mourning is. How to express the void? How to express the loss? Or rather, who can say it better than Chantal? How to make from a presence a constant reminder of an absence? To this metaphysical question, Chantal decided to answer with her films, with her work, about which many of you can speak far better than me. If you listen carefully to the titles of her films, there is very often a question of this strange dialogue between presence and absence, of the impossibility of moving in, of settling down anywhere. Saute ma ville (Blow Up My Town), Demain on déménage (Tomorrow We Move), or even the most recent film, No Home Movie, a film without a house, without a home, without the possibility of moving in. To always be on the road or to think you are: I do not know anything more Jewish than that. Chantal Akerman was profoundly Jewish, I believe. In her questioning, in her humor, her capacity for laughter, and for telling jokes, too. Even her dog BICBIC looked strangely like Kafka, according to her. There was a little Judaism everywhere, including in her questioning of the image, of the ban on representation as it is proclaimed in the Torah, a ban that fascinated her. In reality, what the Bible forbids is the representation of something frozen, a fixed image, something that would no longer move. A priori, what film does is precisely the opposite. It is a refusal of the stationary, a No Home Movie that fuels a universe in motion. I would like to say a final word before letting her family and friends speak, and letting her own words, that we are about to hear, speak. Some of you know this perhaps: Chantal had two names. Her other name was a Hebrew name, Hanna. Actually, to be precise, according to Jewish tradition, you are always called son of so and so or daughter of so and so. None of us exists without filiation, without parents. Chantal Akerman bore the following Hebrew name: Hanna, daughter of Neshama (the name of her mother) and of Yaacov (the name of her father). This sequence of words in Hebrew, Hanna-bat-Neshama-veYaacov, also bears another meaning in Hebrew and forms a sentence that can be translated like this: Hanna is grace, Bat is who-comes-from, Neshama is soul, and Yaacov, as in akev, from the same root in Hebrew, signifying tortuous or sinuous. Hanna bat Neshama veYaacov almost seems to murmur: what is the grace of a tortured soul? Chantal had a tortured soul, tortured by illness and by the ghosts of a murdered world. But she also had the grace, and the light of a brilliant life, creativity, friendships, talent. She was fortunate to have a family at her side, to have talented and remarkable people at her side, actors, writers, editors, people who loved her. The time has come for you, for everyone here, to gather round her nearest and dearest, her sister Sylviane, Sonia, and all the mourners who weep for her. As if for her one could not do both at once. As if one had to choose. Chantal had difficulty doing both. So, in memory of her, you will have to learn to do it. Learn to remember that life and death sometimes take the other’s hand, and that beyond her death, her life can still inspire yours, in whatever you undertake, whatever you play, whatever you film. According to the words of Jewish tradition, after the passing of someone dear to us, Nishmata Tzroura Bitzror Hachayim, her life is woven in with ours. 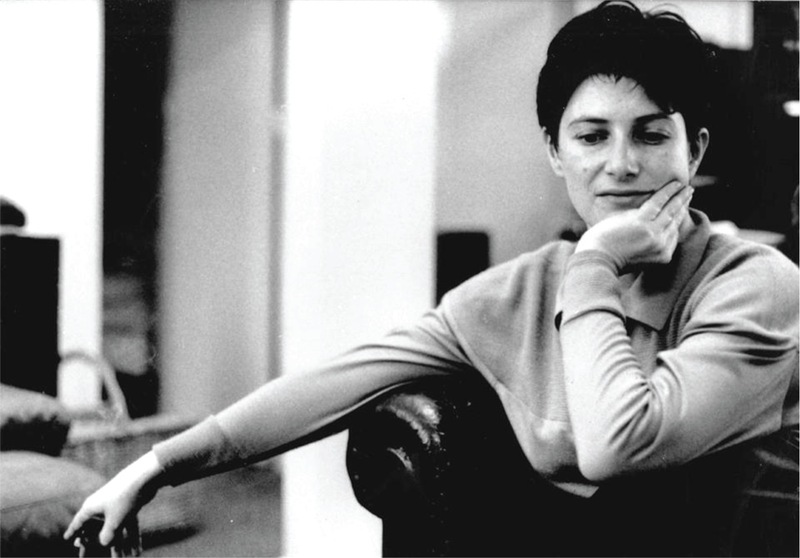 May you weave into your lives the threads of Chantal Akerman’s life, attach them to your cameras, to your images, and to the cords of your instruments… So may she rest in peace in the house of the living.